Everything about Shanghai Dim Sum is small. First, their parking lot that can perhaps park a dozen cars if everyone meticulously stays within the diagonal lines. Then, the dining room, a little square of a thing that has so many tables jammed into it that it’d be surprising if your back isn’t brushing up against a neighbor. Even their dishes are but a mere portion of the heaping bowls of noodles found in congee places, but there’s still enough to leave you full when augmented by their namesake dish. 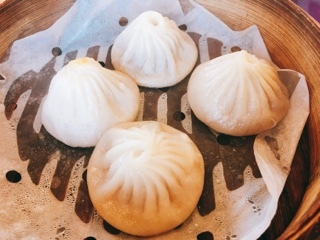 What people come to Shanghai Dim Sum for is their steamed silk skin xiao long bao. 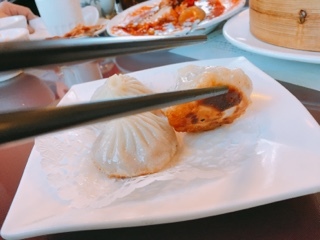 Arriving four to an order, each dumpling is a comforting package filled with scalding hot broth within a thin translucent wrapper. 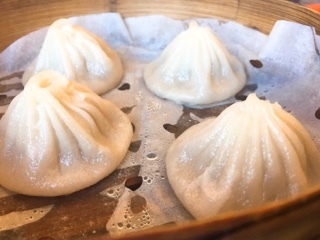 For these, the restaurant also offers them at a low price: the pork filled at $0.99 for first order and $2.99 for second, another version adds crab to the pork for a $1 more ($1.99 for first and $3.99 for second). They look identical, with the exception of the tip of one that’s dyed yellow to help the restaurant distinguish them. I’ll admit, the crab is non-existent except for a faint taste in the background (a hit or miss as can be fishy some visits or sweet during others). But, with the low prices why not try both even if the crab one lacks shellfish? Shanghai Dim Sum is the first place I’ve been to that even offers a pan fried version of the soup filled dumplings ($1.99 for first and $3.99 for second). Try to resist biting into one as soon as the plate arrives, your tongue will thank me later. I love the combination of the soft soupy pork filling and the crispy dough wrapper, what a dish. You can also have a meal of rice and accompaniments at the restaurant, although the dishes are also small and really made for a table of four. 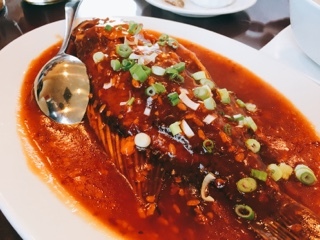 The traditional stewed whole fish with chili sauce ($9.99) arrives deep fried and smothered in a tangy sweet spicy sauce that is has a Thai influence to it. It’s your run of the mill frozen fish that’s been deep fried and slathered in sauce; it’s not great, but at least it isn’t fishy. 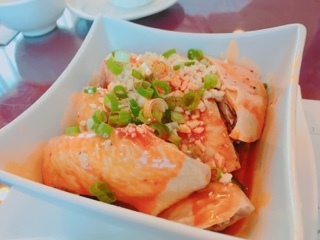 Their boiled chicken with chili sauce ($8.99) sounds plain but something about the tender dark meat sitting in sesame paste and chili oil is really delicious. As a warning, the dish is served cool so the chili oil can congeal a bit. 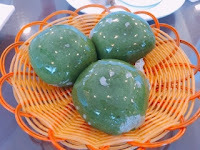 The dish is particularly refreshing in the summer time. Personally, I’d stick with the restaurant’s dim sum and noodle dishes. 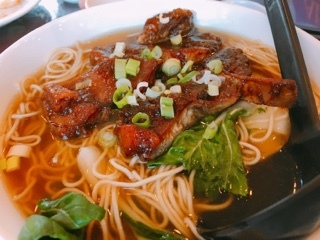 Their noodle in soup is fantastic with thin strands of chewy ones sitting in a salty flavourful broth. 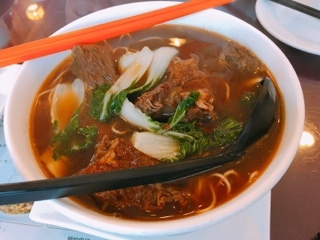 The beef brisket ($8.99) has a hint of spice in the soup and the meat arrives in large chunks that aren’t overly fatty. Although I wouldn’t classify the brisket as tender, it’s also not tough, but could be challenging for people with false teeth. 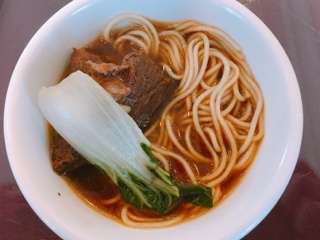 For older visitors, their pork chop noodle in soup ($6.99) may be easier to chew through, the marinated chop a decent thickness and precut into slices to make it easier to share. With a fair number of desserts to choose from, our smaller table went with the kusa mochi ($3.99), which descends from Japan and not Shanghai. 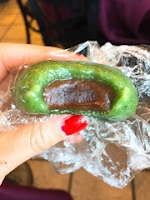 However, the chewy pieces of glutinous flour filled with tons of sweet red bean paste is a nice ending. Since the mochi is steamed, the dessert is lighter than the typical pan fried or fried sweets that are traditional to Shanghai. In the end, all the small dishes were worth struggling to find parking and waiting twenty minutes to squish into a small table. Sometimes it’s nice to remember that good things do come in small soup filled packages.